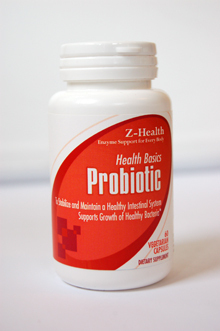 Z-Health has carefully formulated its Probiotic to reflect the relative occurrence of these healthy bacteria in your GI tract. Z-Health’s Probiotic formula contains a combination of both probiotic and prebiotic to ensure a stable and healthy digestive environment. Probiotic & Prebiotic – what is the difference? One Capsule with water before bedtime: Taken on an empty stomach, the Z-Health Probiotic formula helps support healthy intestinal micro-flora. All of the ingredients in this product are GI stable. Z-Health products do NOT include enteric coatings, artificial fillers or flavors. Our capsules are 100% vegetarian.